One of the strange side-effects of having written a restaurant blog for the best part of a decade is that I inevitably end up reviewing the same site multiple times under different guises. "I remember when all this was Foliage," said the wizened old man in me (never too far from the surface) while settling in for a meal at Dinner by Heston. And though it was sad to see Koya go, we can hardly be too distraught that the same space now houses the wonderful Hoppers. And now, where once was Newman Street Tavern we have the shiny sparkly new Dickie Fitz. The story of the old Newman Street Tavern (not to be confused with the still-brilliant Newman Arms, though by all accounts that doesn't stop people) is a weird one. When it first opened, and for perhaps the first few months, it was a stately and refined high-end Modern British gastropub, with things like rock oysters and wild garlic soup and serious game like grouse on the menu. They apparently butchered whole animals in-house, did their own curing, and occasionnally featured niche ingredients such as gull's eggs or kid offal. It was, by anyone's standards, a fine restaurant, and I went around happily recommending it to anyone wanting good food in Fitzrovia (then still a bit of a novelty). Then a while later, perhaps 8-10 months or so, thinking it was the kind of joint that could keep even the most fussy of colleagues happy for a couple of hours, I recommended it as a venue for a work lunch. Yet almost as soon as we sat down I sensed this wasn't the same place I'd reviewed so well in the opening weeks. Staff were distracted and scatty; the handsome raw bar groaning with fresh langoustine and oysters that once bookended the bar downstairs had completely disappeared; and the menu, once a succinct and hand-typed hymn to the seasons, was now redesigned and laminated, with Harvester-like boxes for high-margin items and panicky populist dishes like fish & chips and burgers. What on earth had happened? I guess we'll never know. But it was no real shock to find that the Newman Street Tavern eventually closed, to be replaced by Antipodean concept Dicky Fitz, and though it's fair to say Dicky Fitz less my kind of thing than the first Newman Street Tavern, it's a darn sight better than the last one, and so there is much to be thankful for. I'm not sure what constitutes the "short" element of "Lobster short soup" but it was very nice anyway, a vaguely Asian-flavoured clean, dark broth (probably involving dashi) poured over three lobster dumplings. If I'm going to be very critical the dumpling casings themselves were a bit doughy and undercooked, but the broth made up for it. Asparagus with poached egg is a pretty reliable combination, and won't often stand a great deal of messing about with, but the miso Hollandaise here worked really well, and some nice toasted macadamia nuts added texture. If this is Australian cuisine - intelligent Asian fusion with a lightness of touch and an eye for presentation - then count me a fan. A lovely thick pork chop, juicy and seasoned well and full of flavour, was another fine advertisment for the skills of the Dickie Fitz kitchens, or rather the skills of their pork suppliers; it really was a fantastic bit of pig. I wasn't 100% sure about the black pudding "sauce" hidden underneath (without the texture of the rusk in a normal black pudding the uniformly smooth, jet-black goop was a bit, er, challenging) but after I'd polished off every last morsel of this dictionary-thick slab of porcine joy, everything else was just a distraction. Of course I had to try the burger, and even this didn't disappoint. A fantastic loose mince patty with a good crust, nice pickle and a layer of cheese just the right side of melty. The bun didn't have a great deal of flavour but held firm to the last bite, and I didn't even mind the quite large amount of salad as it was all seasoned well with a house sauce. A nod too to the house fries which although had their skins on (bit lazy really) were doused in chicken salt, a perculiarly Australian seasoning that most actual Aussies are probably completely sick of but I still happen to find guiltily addictive. Fitrovia is not a part of town short of great places to eat. Check my app to see them all. Being a 22-seater no-reservations restaurant by the team behind the wildly successful Palomar, the Barbary was always likely to be popular. Many of the same reasons that had them queuing down Rupert Street (or rather, had them putting their names down and then sitting out the wait in Spuntino up the road) are present and correct here; a swish bar setting and open kitchen, intimate personalised service, an interesting menu of modern Middle Eastern dishes. And I loved the Palomar, like most people did. So why am I not quite as knocked out by the Barbary? The highlight of the entire meal almost was the bread. There was this lovely brittle and bubbly naan, brushed with oil and lightly salted, which had a good savoury flavour to match the addictive textures. It reminded me very much of the house flatbread at Craft in Greenwich, and you've ever been there you'll know that's high praise. And this elongated "Jerusalem Bagel", covered in toasted sesame seeds and warm and fluffy inside. Much like at Palomar, it's clear a lot of effort has gone into the bread offering at the Barbary and it's great to see somewhere trying something other than the usual white rolls or buying in sourdough from St John. House pickles were good - not too sharp or too sweet, with a gentle curry note (I think) and an interesting selection of vegetables. My favourites were a couple of squares of cabbage leaf, which had a nice bite, and the celery, whose powerful natural flavour always works well pickled. This was "Tbecha Roasted Tomatoes", and were fine if you like cold leftover ratatouille but not of a great deal of interest otherwise. Perhaps they would have been a bit more dynamic warmed up but still would have been underseasoned, and one-note in texture and flavour. Similarly these chickpeas - "Msabacha" - one of those things that I'm sure could be fantastic if it had the advantage of more vibrantly flavourful vegetables (as I'm told are more commonplace in the parts of the world the dish originated) or even a bit more confidence with the spices. As it is, a sloppy bowl of bland lukewarm chickpeas and tomato pulp is not enough to get the pulse racing I'm afraid. Roasted aubergine was better, thanks to some nice texture from toasted almonds and a wonderful smoky charcoal flavour from the grilled vegetable itself. You're either a fan of aubergine or you're not, and one man's "smooth" is another man's "slimy", but I enjoyed this dish, and the way the herbs and chilli livened the smooth tahini sauce that surrounded it. Now it was time for my non-vegan friendly choices. Octopus had been slow-cooked to a very soft texture and then finished off on the grill, meaning you got a few of the little suckers all crisp and charred but that the main body of the tentacle was rather mushy. I know there will be plenty of people who like the texture of their octopus to be exactly like this, but I find it rather offputting and would much rather it retained a bit of bite. Also it came dressed with more pulpy cold chickpea, which didn't help offset the general mushy blandness. What's wrong with a bit of lemon? Pata Negra neck was as good as I'd hoped for, though. Cooked perfectly pink with a fantastic char from the coals, it was the finest imaginable advertisement for this wonderful animal and actually quite a generous portion for £13 bearing in mind Iberico pork doesn't come cheap. But I'm afraid one beautiful slab of Pata Negra does not a meal make, and this dish stood as more of a consolation prize than a satisfying grand finale. The bill for two people came to £53 with no booze, which is by no means a fortune, and there was a part of me enjoyed the experience at the Barbary, watching the chefs go about their business and spotting what was on other people's plates. But still, I left unsatisfied, with little of the sense of theatre and passion I'd found at their sister restaurant, and a distinct impression that in that short hop across town something had been left behind. Whether it's the deliberately "stripped-back" menu style (Palomar menu items were descriptive and seductive; the terse Barbary menu - "Duck hearts, Swordfish, Lamb cutlet" - reads like a shopping list) or the self-consciously confident way they filled up the (rather uncomfortable actually) bar seats strictly from left-to-right despite half the room being empty, it all just missed a certain sense of, well, fun. Or maybe I just need to lighten up and learn to love mushy chickpea a bit more. Either way, I guess there's always the Palomar. Can't face the wait at the Barbary? See where else is good in the area with my app. This should have been a review of Bigbe, a Taiwanese fried chicken hole-in-the-wall on Little Newport Street which had been gathering rave reports from people I trusted and seemed the ideal spot for a greedy deep-fried lunchtime binge. Only, when I got to Bigbe, it seemed all was not well. In the kitchens, a woman was yelling in Chinese at a man slumped face down at a prep table, arms over his head. After a lot of shouting, the man slowly raised his head, and turned first towards the woman, and then, wincing slightly at her continued verbal onslaught and wild gesticulations, towards me. I smiled brightly, in an "I would like some fried chicken" kind of way. I sensed the man was attempting to figure out what I wanted, but the effort involved in refocusing his eyes was too much. He stared through me for a few seconds, groaned, and then collapsed back onto the table, arms once more folded over his head. Perhaps today wasn't the day to pursue my craving for fried chicken. I slowly backed out of the front door and away, the sounds of angry Chinese fading behind as I trotted towards Shaftesbury Avenue. Fortunately, I had a backup. Yumi is a brand new "Izakaya" on Shaftesbury Avenue, attached to the Piccadilly West End Hotel (there's a space on the bill to charge your meal to a room) and backed, apparently by the ETM Group. Certainly there are worse restaurant chains than ETM - the Gun in the docklands and the Well in Clerkenwell were some of the defining gastropubs of the early noughties, and I believe the Jugged Hare is great for cheap(ish) game - but a Japanese bar in Covent Garden is quite a different beast entirely. Could the skills be transferred? Well, let's find out. Miso soup was first up, and was nice. I'm not entirely sure how mind-bendingly brilliant it's possible for miso soup to be, but the seaweed had a good bite and the tofu was soft and the broth itself was hot and umami-rich. And at least it didn't have big flabby mussels floating about in it. "Kimuchi" is, as far as I can gather, a slightly bland Japanese version of kimchi; not inedible by any stretch, just missing some of that funk and fire of the real Korean deal. OK, so I'm criticising a dish in a Japanese restaurant for not being Korean, which could be unfair, but the point is, this is London not Hokkaido - proper kimchi is available, at Koba and On The Bab and (further afield) the fantastic Jin Go Gae in New Malden - and anyone lucky enough to try the real thing in those places will be fairly nonplussed with this version. From the robata - eventually - came these chicken thigh skewers. I say eventually because it took a good half an hour for them to appear (dishes arrive as they're ready), and I was increasingly worried that either the meat would be wildly overcooked or their grill wasn't hot enough. In the end, it turned out to be the latter. Pale, wobbly and fatty, these desperately needed a bit of colour and crust from the coals, and a decent gloss of powerfully-seasoned tare marinade did not make up for the pretty unpleasant texture. Gyoza were better, but not perfect. The overwhelming taste of the filling seemed to be spring onion, although the menu didn't mention that as ingredient at all so perhaps it was just a lot of pickled ginger that tasted of onion. Either way, the pork element was quite low-key and what I did detect was rather dry and mealy, although the casings themselves held up well and the dipping sauce was good. I mean, they were fine, you know, just not quite as good as you might expect. Which pretty much sums up the place, in fact. What I really want, I realised after I'd paid up and left, is for Bincho Yakitori to move back to London. Their grills were always full of the most weird and wonderful cuts of meat and interesting vegetables, from chicken neck skewers to hearts and liver, to stuffed mushrooms, accompanied by pig's tripe soup and vibrant house pickles. 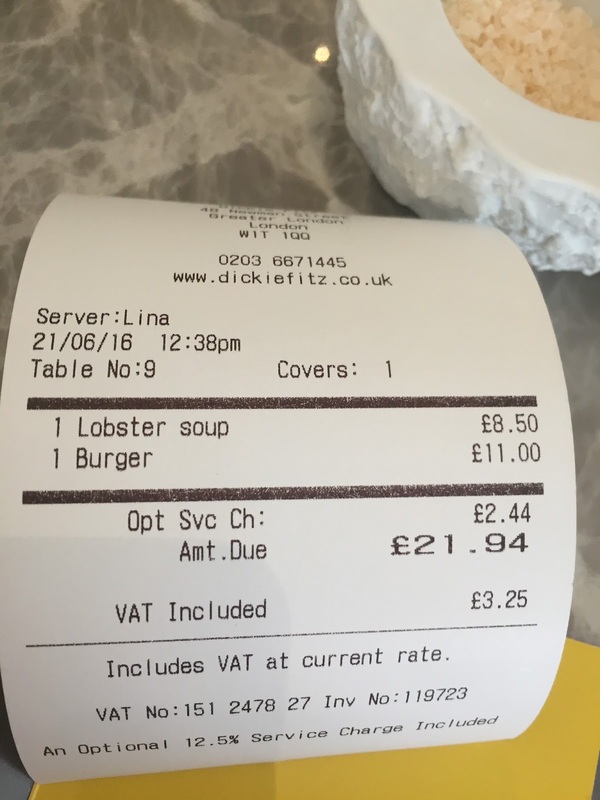 And the bill rarely stretched over £20 a head no matter how much you ordered. But it seems the Soho rents became to much and they relocated to Brighton. Where apparently they're doing very well, so good luck to them. Maybe my expectations were too high. 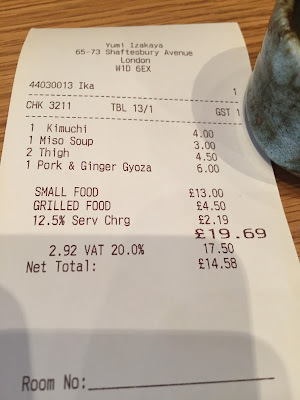 Yumi is a little unpretentious Japanese restaurant on Shaftesbury Avenue serving (charmingly and attentively) a small menu of undemanding Izakaya dishes and they're clearly not aiming for the heights of gastronomy. Which is fine, but I just wish someone would at some point take the food side of things a bit more seriously - I'm convinced that there's a way of doing this stuff incredibly well and for good value, and we shouldn't have to choose between some corporate proto-chain concept on one hand and a £100/head glitz-fest of Roka or Umu on the other. Or maybe - and this is the really terrifying thought - the economic realities of London in 2016 mean that the days of Bincho Yakitori are a thing of the past. I bloody hope I'm wrong. Central London still waits for a decent Izakaya. 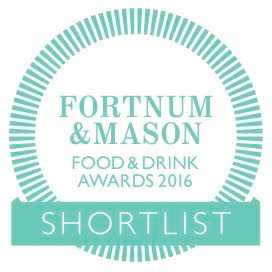 Meantime, there's plenty of other options for booze and food on the app. There are good restaurants, and there are great restaurants, and there are influential restaurants. Restaurants whose style and individuality, and bold or unique take on a particular cuisine sets them leagues ahead of the pack, and whose identity and attitude becomes a template for countless others. I'm thinking about places like Polpo, who reinvented the wine bar with food for a generation that suddenly discovered sophisticated dining wasn't all about tablecloths and silver service and was for them, after all. Or MeatLiquor, who did for restaurants what punk did for music, matching a counter-cultural aesthetic with irresistable comfort food classics hitherto unseen at this standard in the UK. These places changed the way we eat - and not just in London; poke your head into any town in the country and see how many "burger & cocktail" shacks there are, or ciccheti joints serving Aperol Spritz. If you've been keeping your foodie eyes and ears open you'll have noticed a number of Indian restaurants opening recently with certain features in common. There's Kricket in Brixton, which I honestly will get around to doing a proper review of as soon as possible because their food is seriously impressive. And Gunpowder in Brick Lane, another tiny, friendly space that's made a fan of anyone lucky enough to have eaten there. Both serve a selection of idiosyncratic Indian flavoured small dishes for not very much money, alongside craft beer and cocktails and served by warmly informal staff, and it's really not too difficult to spot their spiritual ancestor - Dishoom, which moved Indian food away from the High Street curry house, made it funky and fun and is now (quite understandably) spreading across London. There are now four of them, and they're all brilliant. 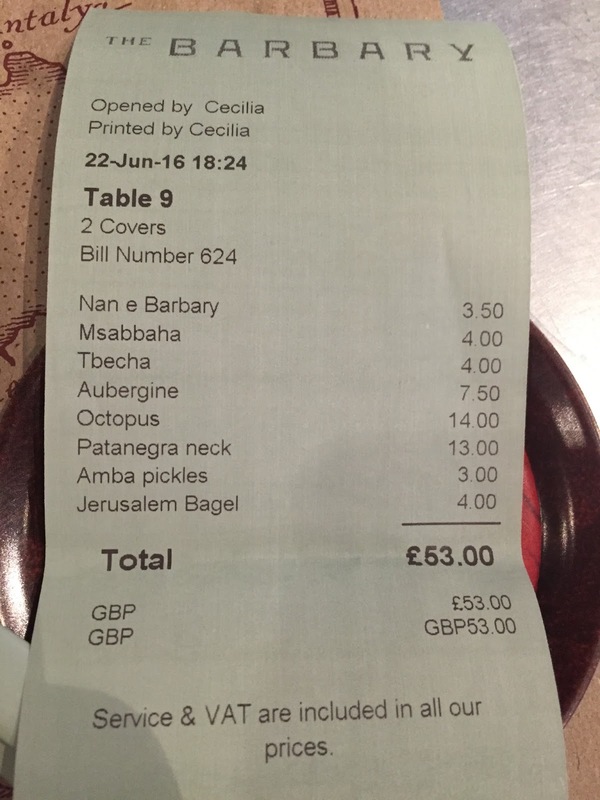 So who cares if the menu, and décor, and attitude at Talli Joe, on Shaftesbury Avenue, feels a little familiar? If you're going to be inspired by anyone you may as well start with one of the great London restaurant success stories, and as you'll hopefully see, Talli Joe are still offering a menu of remarkable inventiveness and variety, and a few things I've never seen anywhere else in town. For example, the idea of putting a fresh tomato/chilli mixture inside mini baked papadum cones, which look pretty and taste great (fresh and with a bright chilli kick); perhaps it's not the most revolutionary idea on the planet, but I've never had them before. These were also new to me - "wafers" made out of raw Kerala banana, seasoned with citrus salt. A great snack, and though the banana itself didn't have a huge amount of flavour, the citrus salt was incredibly addictive. I'm afraid I didn't much like the Talli Joe house pickles - they were too heavy on the vinegar and not sweet enough, and maybe a bit of colour variety would have been nice instead of just a small bowl of pink cauliflower topped with a single (and seemingly hardly pickled at all, just raw) green chilli. The Talli Joe lamb chop is, unquestionably, a prime example of its kind. Soft pink flesh inside, encased in complex spicing and a good char from the tandoor, it was everything you'd hope for in a lamb chop. 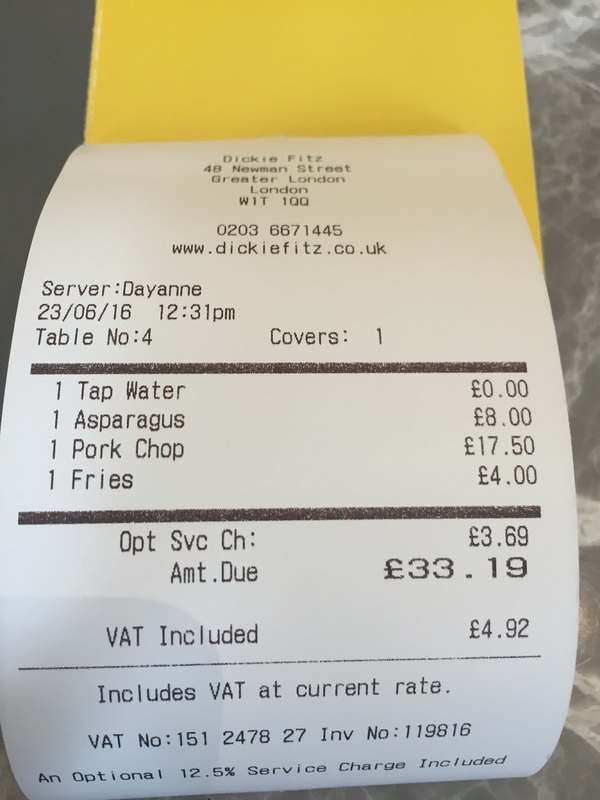 But is £5.50 too much to pay for what is barely more than a single mouthful of food? 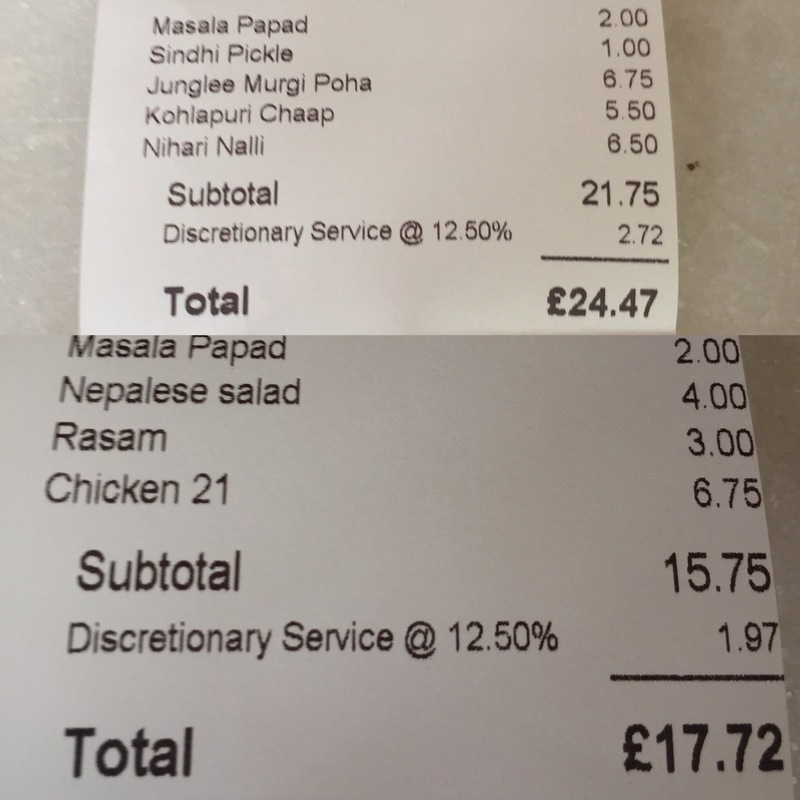 At Dishoom, £11.90 gets you three. Just sayin'. 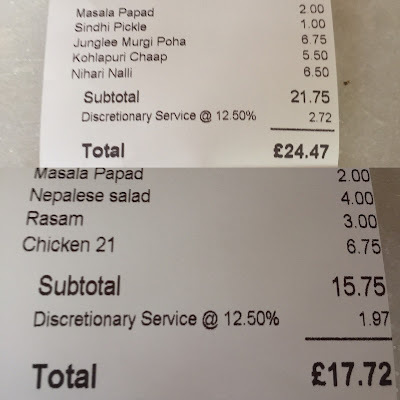 The tandoori guinea fowl ("Junglee-Murhi Poha") was also excellent, and better value - a decent-sized bowl for £6.75 containing huge chunks of moist poultry. It's always good to see curries made from something other than the usual ingredients; the influence here is perhaps more Gymkhana (with their occasional game dishes) than Dishoom. Still, there's worse places to be influenced by than Gymkhana as well. And maybe this bone marrow dish has another Sethi family restaurant - Hoppers - in mind? The bones themselves were expertly roasted and the marrow fell out in satisfying buttery chunks, but I'm afraid in comparison to the wonderful roti at Hoppers this rather dry bit of bread, resembling scrunched up paper and not tasting too dissimilar, suffered. Still, the little pot of curry that came with it was nice, and it's at least something that's still rather unusual to find on an Indian menu in London. So points for that. Chicken 21 was superb; tender cubes of meat that had been cleverly fried to a crunchy casing, in a rich and rewarding spice. I loved every bit of it. The only dud note - in fact the only main dish I didn't much enjoy out of everything I tried - was this Nepalese prawn salad, a daily special which contained too many very bitter leaves of radicchio for my liking. Still, one dish out of ten I wouldn't order again isn't a bad hit-rate is it? And so, as you can hopefully tell, I liked Talli Joe. Yes, it wears its influences on its sleeve somewhat, but those influences are themselves so positive that the end result of cherry picking bits and pieces from Dishoom, Gymkhana, Hoppers and the like could only ever have turned out to be a success. Perhaps the prices are £1 or £2 more per dish than you'd ideally want but this is, after all, a large, modern restaurant in the middle of Covent Garden and in stark contrast to a lot of the other rubbish in that area at least you can see they're trying. And for that reason, and so many others (not least the fact it's 10 minutes walk from the office), I can see myself being a bit of a regular. I doubt Talli Joe has done quite enough to make it into my 2017 top 100, but see where else did for 2016.